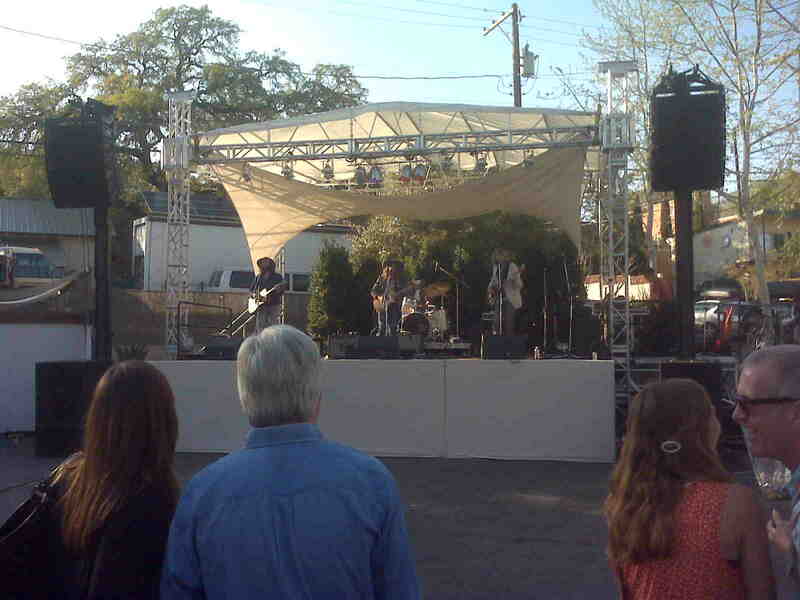 Music in the ATX: Thursday at SXSW -They know Bruce in Iceland??? Thursday started out as another beautiful sunny day in Austin but still cool - which is the perfect weather for SXSW to me. Our plan was not nearly as complete as the day began. All the kids had signed up for the COS / Sled Day party that was originally to be held in East Austin but was moved to a new location due to expected attendance. One of the things you learn about RSVP's is that everybody and their brother responds to every party and last time I checked you can only be at one place at any time. So the party moved due to responses and nobody was there. I dropped them off and found some parking then hit Frank - the upscale hot dog place that had a temporary store setup inside to sell vinyl from Jack White. A friend in Atlanta is a huge Jack White fan and he wanted copies of De Stilj and whatever 8" singles were being sold. Got to admit I don't really get Jack's music but always glad to help out another music fan! After getting the necessary vinyl I met up at the COS / Sled party and the first band was still on soundcheck an hour after they were supposed to start. I went out exploring and noticed that Sony Records had a party going on at Antone's with as their sign said "Free Food, Free Booze, Free Music". Checking back at COS the soundcheck was still in progress so the easy decision was let's check out Antone's. A mexican buffet was available and free beer and vodka drinks so everybody was happy about the decision. 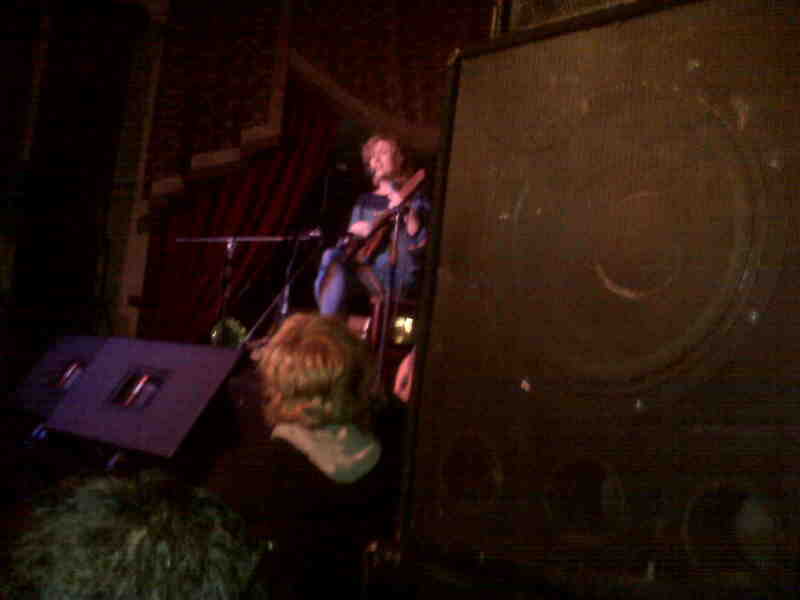 Nneka was playing on stage when we got there - a singer from Nigeria who has apperared on Letterman. Her final song "Heartbeat" is a great song with a terrific sound to it and you might want to check her out. Next up on stage was Becca. She is a 21 year old who has had great success in Japan but is just having her first full length CD released in the US. Her music would be classified as power pop - lots of songs about boyfriends or ex-boyfriends as she said! She had great stage prescence and was a hit with the whole group. Several CD's were purchased and she hung around afterwards for some pictures before getting back in the Econoline van. It was an interesting collection that Sony presented from around the world. Kashmir from the Netherlands was up next and they played some classic sounding rock and roll. Of course about then I realized it was nearly 3 PM and no lunch so I headed out to Frank to test their hot dog quality. Frank is advertised as a Chicago style hot dog place with a bunch of funky hot dog / sausage offerings. They do serve a darned good hot dog, poppy seed bun and all! It's not Portillo's in Chicago but it's a quality hot dog. Most welcome was a seat, a cold Coke and a chance to check up on first round NCAA games on the Blackberry. Nothing else planned for the day time schedule so I headed to South Congress as there were six or seven places hosting multiple bands all day long. I hit the Yarddog Gallery first as they had a tent set up behind the studio. A band was just starting but they were horrible so I checked out the Freebirds Burritos show as well as Home Slice Pizza but found nothing better there either. There were bands playing everywhere - it really is an amazing scene. Bands at Guero's, in Cissi's Market ( a grocery store) and in the parking lot of the Hotel Austin. I settled on the parking lot of the Hotel San Jose for the South by San Jose show. This is one of our favorite spots as they have a good lineup every year. They had a new stage setup this year which is a great enhancement now putting the bands five feet or so above the parking lot and definitely helping with sight! By the time I got there Dax Riggs was playing. Their sound would fit in the Southern Rock category but nothing special to me. Next up was the Smokey Angle Shades from England. I liked their sound - again Southern rock tinges mixed with country but with an English twist. Alsways entertaining to see a lead singer with no shirt but a sport coat - interesting! After this I headed over to Home Slice Pizza for a slice of pizza as my dinner on the fly. This is definitely the best pizza in Austin in our opinion and a window especially for slices is just what we like. Our friends the Sierra's have two sons who are musicians and they have a new band called the Sounds of Substance. They were playing their first show that night at a coffeehouse called Blu so I headed in that direction. It's in the bottom of one of the new skyscraper's in Austin and a pretty small space so when I got there all the bands waiting to perform were just out on the sidewalk. I saw a long line across the street and realized it was the Austin Music Hall where the Stone Temple Pilots were playing later in the night. It was a $30 ticket for the Pilots so I opted for the free show at Blu. A band called Wahnder Lust was playing when we got there and they are working at keeping Austin weird just with their dress. The female lead singer who said she also sings in George Clinton's Parliament had some goofy hat on and the guitar player / singer had on strange glasses and a top hat! Only in Austin. As is often the case at these unofficial shows the schedule gets way off and the 9 PM start for the Sounds became 9:30. I had committed to seeing an Icelandish singer at 10 with my nephew and his girlfriend so I coukld only catch a couple of songs before walking 12 blocks in 15 minutes to the Driskill. 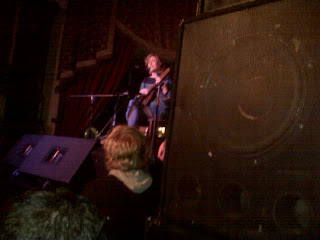 The target was to see Olof Arnalds - a young singer from Iceland. I'm not sure how Natalie picked her out to see but I will say I'd never seen a singer from Iceland before - not sure I ever will get a chance to again. She was playing some kind of a ukelele in this small room in the Driskill. Intimate would be an understatement! The biggest challenge were the songs were in Icelandish I guess - some other language that's for sure. She did sing one song in English by somebody who I'd never even heard of. A few more songs in Icelandish and then she says she only has time for one more song. The first few chords seemed familiar even on her strange ukelele and them I looked at my nephew and said "it's a Bruce song". Even Icelandish girls like Bruce songs and she chose to end the night with "I'm on Fire". A great ending to a unique SXSW experience. After this show we rounded the group up and decided to hit Gourdough's on our way home. Another trailer eatery that makes awesome donuts. My nephew had one with bacon and maple syrup and that's just the start of the menu. On the way home the mom's (Jo and Auntie Kar) called and said they were just leaving the show. We thought they had stayed at Blu for more bands but only when they got home did we find out they went across the street to see the Stone Temple Pilots with some friends. They said it was a terrific show in a small venue and we weren't sure whether to be jealous or not since we had crazy donuts in our stomachs. The end to a crazy Thursday at SXSW!!! !